Located in the busy market town of Lewes, East Sussex, this project provided improved flood protection from the River Ouse to a new residential development on the site and residents and businesses along the river. 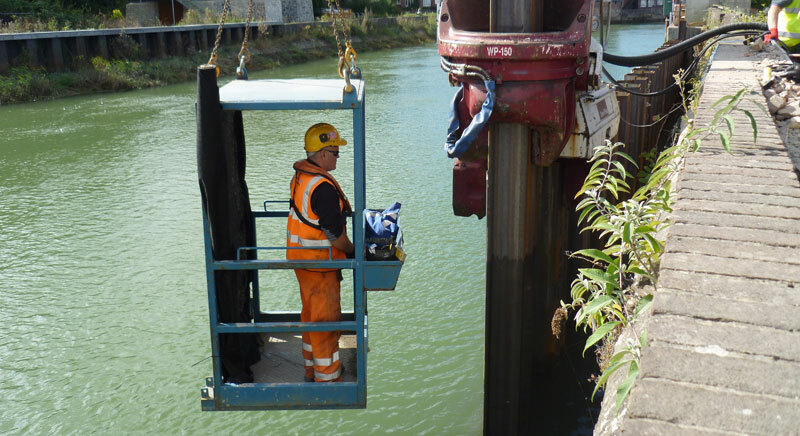 Work on the main river wall installation was carried out using a silent piling system, in the form of a still worker, as the project was located close to residential premises. Works took place in a tidal environment and this meant certain aspects of the project had to be timed to coincide with low tides. With extensive experience of working in tidal zones, our project team was able to ensure works were programmed accordingly. • Installation of a permanent river wall consisting of 112no 16m long PU28+1 sheet piles connected to a new sheet pile anchor wall, located within the site, by a tension bar system. • Construction of a R.C. capping beam and upstand wall to the new sheet pile river wall. • Construction of the final section of SW drainage - including a 3.5m deep, 1.2m dia manhole - from the site, discharging into the river. • Initial enabling works on the low level concrete apron, between the existing masonry river wall and scour pile set-up, were only able to be carried out at low tide.